When Georges Melies first released what is widely acknowledged as the first-ever sci-fi film, A Trip to the Moon, he debuted a combination of ground breaking compositing techniques that showcased to audiences just how powerful visual effects could be. When George Lucas brought us Star Wars, he changed movie history with what many would argue was the original box-office blockbuster. With Hyperlight, we aimed to continue that tradition despite our restricted timeline and budget. 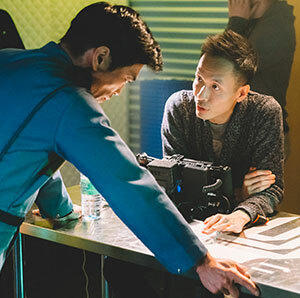 Together with director Nguyen-Anh-Nguyen and his amazing team, my role as post production supervisor aimed to expand what science fiction could be. The result was a short that would introduce everything from a dramatic love story to a sequence created entirely in VR, all in time for a UK debut at Sci-Fi London film festival. Below are my six top tips and tricks for the methods we used to reinvent sci-fi on an indie budget. When it comes to sci-fi, many find it easy to slip into a paint-by-numbers narrative that caters to what audiences expect to see when watching anything within the genre. Of course, incredible visuals are certainly something you’ll likely want to create but it’s crucial to always challenge what a sci-fi story can be beneath the beauty. With Hyperlight, we aimed to tell a dramatic love story that though set in space was much more focused on the human aspect of what interstellar space travel could entail for two elite astronauts. It was a much slower paced film than your typical sci-fi, with tension being built up through camera work and our visual effects in post. Despite the slower storyline, as Hyperlight evolved we realised that it would actually require more visual effects than any of Anh’s previous projects, which was a challenge when it came to budget and time. This brings me to my next tip: always be efficient with your tool choices. Blackmagic Design cameras were used to shoot the entirety of Hyperlight in 4K CinemaDNG RAW, which meant that in post-production, we had access to DaVinci Resolve Studio for free as it came with the cameras. Using Resolve Studio, we could fully edit and grade the entire short. Every VFX shot was numbered, detailed with precise notes using the title tool, and reconformed to the original DNG files from our URSA Mini Pro. The burn-in function added by the editor helped a lot early in the process, where most of the VFX shots were little pink squares moving around the screen. These edits were then exported as EXR and sent to the two post houses and six VFX artists who worked on the short. A first grading pass was also created to produce a LUT for editing, and to give direction to the VFX artists. All the new VFX shots were replaced in the edit as they came in, so that our offline editor could make sure the edit was still right. Since both editing and grading were happening on Resolve Studio, the conform was painless: what would have taken hours of night work by an assistant to import and adjust VFX shots, we were able to do within minutes. As post production supervisors, we often get thought of as someone who only has the ability to provide input once the shoot is complete. A crucial part of being able to redefine a sci-fi look for Hyperlight, though, was my on-set presence. We would always try to think outside the box, and being on set meant I could factor in potential issues for post-production such as chroma spill from all our green screens. For our very visual effects-heavy opening scene, involving people flying in pods around a big ship, with a planet in the background, we took advantage of the URSA Mini Pro’s built-in ND filters so that our DP Simran Dewan could forgo the use of a matte box. This meant the lens could get much closer to our scale model pod and ship miniatures, so that he had the freedom to shoot some great unexpected angles for the final film. When most people think of sci-fi, they imagine a cold, blue, steely palette. Anh wanted to change that. With the grade on Hyperlight, our aim was to help symbolize the warmth of humanity within this small space ship, surrounded by the darkness of space. In Resolve, our colourist Simon Boissonneaux achieved this by using the colour toolset to enhance saturation, ultimately creating a golden aesthetic with warm skin tones that perfectly complemented the look already captured in-camera through the colourful practicals installed on set. We enhanced the colours and saturation, then hid some of the set imperfections with mattes and vignettes. Even when not in post-production, you can also always try to expand your horizons when it comes to the look of your sci-fi through elements like casting choices. As an Asian-Canadian, our director Anh didn’t understand why an Asian lead - or a female heroine, for that matter - weren’t much more common on the big screen when it came to science fiction. Last but not least, never forget to see if you can take advantage of the latest tech to bring your sci-fi to life. After releasing Hyperlight, we decided to create an extra bonus scene entirely in virtual reality, so that audiences could feel what it was like to relive the opening sequence from the short, but through the eyes of our main protagonist in the depths of space. We are currently working on completing this to bring a whole new perspective to the short, and the way it could be watched. Because we could recycle all our 3D models from the short within Unity to create the VR scene, it hasn’t been too difficult to create so far, and we’ve gotten some pretty fantastic initial results. It means we can now think about screening Hyperlight not just at the main short film and sci-fi festivals, but at upcoming VR festivals too.